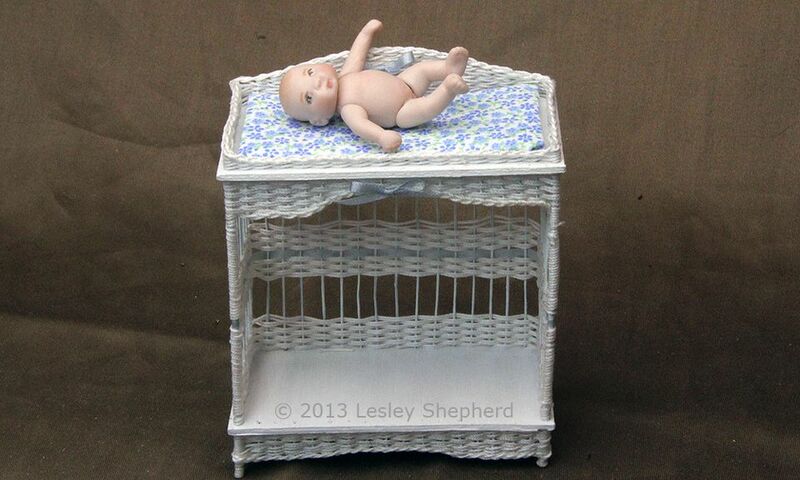 This dollhouse miniature wicker change table is part of a series of nursery furnishings in dollhouse scale. Like the Simple Baby Basket it is made by weaving crochet cotton in bedspread weight over painted wires. This is a fairly simple introduction to woven "wicker" or lloyd loom furniture in dollhouse scale. If this is your first attempt at woven miniature furniture, use a fairly heavy weight crochet cotton (or fine string) and heavier weight weaving wires than I used. The patterns can be adapted to make a range of styles by mixing your weaving patterns, using different thread colors (natural works well), or adding more rows of ribbon. Fine 1/ 16 inch (2mm) or 1/16 inch (3mm) Aircraft plywood. Use the thinner plywood for 1:24 scale. You can use card or craft wood, but it may split when drilled. Stiff wire - for the corner supports. I used 18 gauge wire. You will need four lengths, 3 1/2 inches (9 cm) long for the 1:12 table, four lengths, 1 3/4 inches long (4.5 cm) for the 1:24 table. For the smaller scale table you may want to use finer wire. Fine Wire - for weaving rods. I used # 28 gauge, but it is easier to use slightly heavier wire, 26 or 24 gauge. For the 1:12 scale table you will need 3 1/2 to 4 inch (9-10 cm) lengths, depending on the height you want your table. I needed roughly 16, 12 inch wires for this project. For the 1:24 scale project you will need roughly 2 inch (5 cm) lengths. Crochet Cotton - I used a bedspread weight #10 cotton. Beginners can also used heavier thread or waxed linen thread. For the smaller scale change table you can use a single strand of cotton instead of the double strand I used. Miniature Drill - to drill the holes for the wire rods in plywood or card. Use the drill bits which are slightly larger than your wire sizes. Acrylic Paint and if necessary acrylic medium to paint your wires. Acrylic medium will help the paint 'stick' to the wires. Crochet Hook - to help weave threads through the wires. Fine Ribbon - For trimming the project, or you can use colored embroidery floss. Small rectangle of fabric glued over card - for the change table pad. Begin by using the template to cutting fine plywood or heavy card sections to use as the shelf and top to support your wires. Using the template drill four holes for the larger wire 'legs' in the corners of the wood or card sections. Change drill bits to fit your finer wires, and drill the holes shown between the corners using the template. Make sure your holes are drilled cleanly. Paint your shelf and top if desired, and drill all holes a second time to make sure they are free of paint. Paint your wires to match your thread color. I needed two coats of paint on all my wires. I set the wires on end into a piece of scrap styrofoam to dry between coats. Begin to assemble the miniature change table by inserting the heavier wires into the corners of the bottom shelf of the table. Fit the finer wire sections (roughly 3 1/2 to 4 inches long)(9 to 10 cm long) into the sides and back of the shelf as shown. Set the wires so they emerge 1/4 to 1/2 inch (6 - 1.2mm) below the shelf. (1/8 to 1/4 inch (2 - 5mm) for 1:24 scale). This will form the kickspace. Match it to other furniture pieces if necessary. Take care when inserting the wires that you keep them as straight as possible. If necessary drill your holes slightly larger to accept the wires. Sometimes painting the wires makes them too thick to fit through the holes you originally drilled. As you fit the wires, apply a small bead of glue to the wire under the shelf to hold the wire securely in place until the weaving begins. Leave the holes in the front of the shelf empty as shown. To prepare for weaving the miniature wicker change table, finish off the weaving wires by setting small 1/4 to 1/2 inch fine wire sections in the holes at the front of the bottom shelf as shown. These wires can be leftover bits from cutting your main wires to length. Try to set these wires so they are slightly below the top of the shelf as shown. If necessary, they can be trimmed to length later with end cutters. Glue these wires with a small bead of glue to the bottom of the change table base. Take care not to use too much glue, you need to be able to weave close to the shelf. To begin weaving the miniature change table cut a 1 1/2 to 2 yard (1 1/2 to 2 M) length of thread and loop it over one leg of the miniature change table just under the shelf. You want the ends of the thread to be equal on either side of the leg. Using Pairing Weave take one thread around the back of the first weaving rod, while the other thread goes around the front of the rod, making a series of figure eights which hold each wire on the base of your miniature wicker change table. See photo above. Work at least three rows of pairing to hold the wires securely under the shelf. If you wish you can continue weaving rows of pairing until you make the base of the change table the depth you prefer. I chose to make the base a bit more decorative by working three rows of randing or in and out weave. For my randing I used a double strand of crochet cotton. You can switch from pairing to randing at a corner by using both threads for the randing weave. To make the base weave secure, after the randing pattern I used rows of pairing to finish the base. The rows of pairing were worked back and forth leaving some of the front wires empty, weaving back from the center and changing direction an equal number of wires from the front once the other side was reached. This makes a curved front on the base of the change table if you wish. To finish the base, apply a bit of glue to any exposed wire on the legs and wrap the legs neatly with your crochet cotton, setting it down into the glue. After the glue has dried, trim the ends neatly. Adding In Threads As you weave you will need to add in new sections of weaving thread. I find it neater to leave the ends exposed in the center back where they are easy to glue "off" after the weaving is finished. You can also choose to start any new section of thread with a loop around the leg to begin a new row. If you are comfortable with weaving to proper tension, you can continue to weave rows of randing and pairing above the bottom shelf, making a pattern of weaving using randing and pairing in balanced patterns. This weaving will form the main body of the change table. I used a section of ribbon to set a pattern halfway up the change table sides and back, gluing the ribbon to itself at the outside leg edges. As I was weaving with the top shelf in place, I used rows of double randing to form the pattern on the sides and back of the change table. If you choose to leave sections of the wire support 'rods' exposed, you can leave an equal length of the wire legs without thread, and glue and wrap the exposed leg sections after you finish weaving the body of the change table. Note - If you are a beginning weaver and not used to keeping an even tension as you weave, you may find it easier to set the top shelf onto your weaving wires and glue it in place at the height you want your change table surface (I set mine at the equivalent of 36 - 40 inches or 3 - 3 1/4 inches (8 cm) above the floor surface. The top shelf will prevent your weaving tension from pulling the sides and back of your change table off square. If you are using fine wires which bend easily, this will help prevent problems even for experienced weavers. Once the top shelf is placed on the wires, apply a bit of glue to the underside of the top shelf at the leg wires to hold the shelf in position. You will need to set some 1 inch (2.5 cm) sections of wire (1/2 inch or 1 cm sections for 1:24 scale)through the holes at the front of the changing table top. The wires should have roughly 1/4 inch (5mm) above the change table top with the rest of the wire below the change table top. Glue these wires neatly with a small bead of glue on each wire below the shelf. If you add the top shelf, you will need to weave your threads through the wires pulling them in and out with a crochet hook or bent section of wire. This is more time consuming than weaving up to the top shelf before you position it, but you will not risk pulling your table out of square and having to repeat the weave. The weave below the top shelf is woven so the center wires are free of weaving until the last few rows. This pattern will create a curve beneath the shelf of the miniature change table (see the photo on page one of this tutorial). Once you have finished weaving the body of the change table, start a new thread around one leg of the change table above the change table surface at the top and work three rows of pairing around the entire top edge of the change table as shown. Notice that the extra wire below the shelf (and on the base of the change table) has not been trimmed yet. Once the main rows of pairing are completed, weave across the sides and back of the change table, then reverse direction leaving the front of the change table at three rows of pairing. Work across the sides and back until you have at least 1/4 inch (5mm) of weaving on the sides and back. To shape the weave across the back of the change table begin to weave back and forth across the back, dropping one wire on each side as you weave to shape a gentle curve as shown. When you have the back shaped to your preference, finish the weave by taking the thread through to the back of the change table. With the weaving done it is time to finish the edges of the dollhouse miniature wicker change table. Use a crochet hook or a section of wire to line up all the weaving so the shapes are well defined. Pay special attention to any curves you shaped as you wove. Use end cutters, kitchen shears or wire cutters to trim the wire rods and legs to length at the top of any woven edges. Apply a small bead of glue to the threads at the top of each wire to hold the weaving in place. Allow the glue to dry. Use a tiny amount of glue to hold any thread ends in place to the weaving, trimming the ends after the glue has dried. Apply glue to exposed areas of the legs and wrap them neatly with thread. When all the edges have been finished, make a simple three strand braid or six strand braid from crochet cotton or embroidery thread (if you want to add another color). Braid a length long enough to go completely around the edge at the base of the change table, and along the top edge of the change table. If you wish you can also braid sections to edge the shelves. If you don't want the look of a braid, make a simple twisted cord from embroidery thread and use it to finish your edges. Apply a thin bead of glue to the top edges of your weaving covering the ends of the wires. Apply your braid or cord finish to the edge, covering all the wires ends and any exposed ends of the leg wires (on the top of the change table). Allow to dry. Make Miniature Ribbon Bow Trims You can finish your miniature wicker change table with tiny bows at the front and top center of the table to match your nursery decor. I used fine silk ribbon and tied small bows using a simple bow former made using pins. Once the bows are formed, cut the ends, finish them with fray check or glue, and glue the bows to the center front and top back areas of the change table.To Make a Changing Pad Cut a small section of recycled card to fit across the top of your change table surface. Cut a small piece of fabric roughly 1/4 inch (5 mm) larger than the card on all edges. Lay the card on the wrong side of the fabric and apply a thin bead of glue to the edges of the card. Turn the fabric back over the card on all corners, setting it into the glue. Fold the remaining side edges of fabric over on each side, pressing them down into the glue. Allow to dry. Turn over the change pad and fit it to the change table top. The change table matches the miniature baby basket . If you wish you can make miniature baskets for the bottom shelf using the method shown for miniature woven pastry baskets.